Matt Wechsler and Annie Speicher are the storytellers at Hourglass Films behind “Sustainable”. The film is a passion project for them, combining their roles as food activists with their talents as documentary filmmakers. 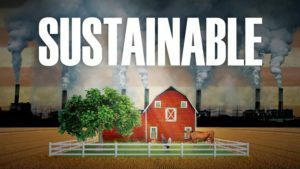 “Sustainable” was screened at 20+ film festivals around the world and recently won the 2016 Accolade Global Humanitarian Award for Outstanding Achievement. They are currently working on a new film called “Right to Harm” about the health effects of factory farming on rural Americans.